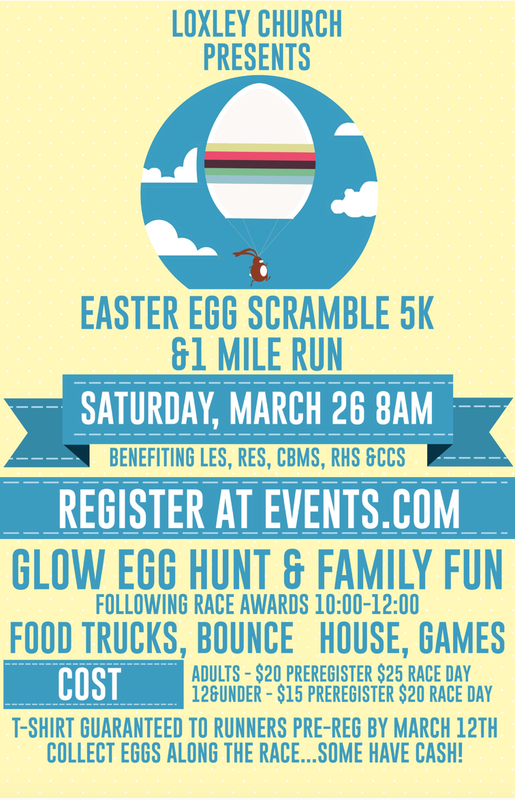 On Saturday, March 26th starting at 8 am, the 1st annual Easter Egg Scramble 5K, Fun Run & Family Fun Day will begin in Loxley at Loxley Church 5220 S. Hickory Street. Loxley Church is proud to present this event and all profits from the event will benefit five local schools (Robertsdale Elementary, Loxley Elementary, Central Baldwin Middle School, Robertsdale High School, and Central Christian School). This event is a certified course open to runners of all experience levels. 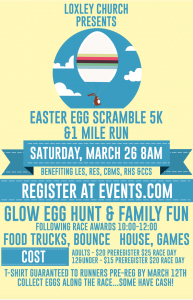 Individuals interested in running can register online at https://events.com/r/en_US/registration/easter-egg-scramble-5k-and-fun-run-loxley-march-10348 or in person at McCoy Outdoor, Run-N-Tri, or Fleet Feet in Mobile, Running Wild in Fairhope, Loxley Church, or the school offices at RES, RHS, LES, CBMS, or CCS until noon onThursday, March 24. The race entry fee is $20 for adults and $15 for youth. Following the race, the Family Fun Day and Glow Egg Hunt will being and is a free event. For additional information please visit http://loxleychurchofgod.org/ or their facebook page. So don’t miss out on this great opportunity to join in all the fun and help support our schools!